The Beijing World Park is must see on the itinerary of those traveling with children through Beijing. The park features about 100 miniature models of some of the world's most famous tourist attractions from over 50 countries across the globe, and is designed to let visitors experience a trip around the world without ever having to leave Beijing. It has become such a popular spot for taking photos that many couples have used it as a backdrop for their wedding photos. The sights include Egypt's Great Pyramids, France's Eiffel Tower, India's Taj Mahal, England's Stone Henge, and even New York City's Manhattan Island, complete with landmarks like the Empire State Building. Although the park can be a bit empty, depending on the season, it is a great place for kids to learn and enjoy naming the attractions as they stroll through the replicas. Summer is the best time to visit Beijing World Park, as it is a venue designed for sunny weather. 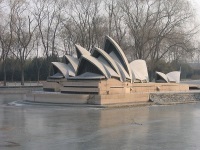 Transport: Bus routes 477, 480, 987, and 692 provide transport to Beijing World Park. Opening times: Open daily 8am-5.30pm (April to October); 8am-5pm (November to March).